Did you know vinegar has many uses besides cooking? Vinegar consists mainly of acetic acid and water and is effective in killing most mold, bacteria and germs. Therefore, it’s a very effective household cleaning agent. 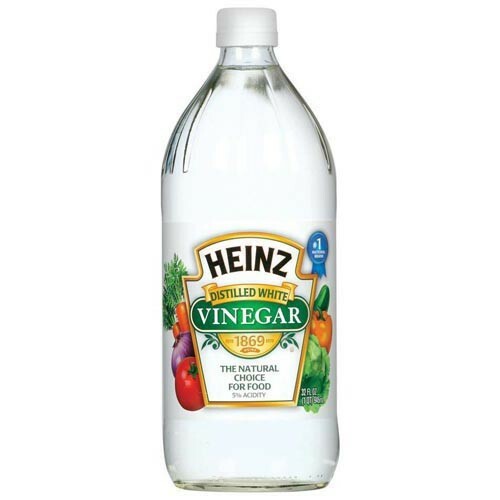 Here are twelve simple household uses for vinegar. Dissolve Crayon Marks on Walls: Moisten a toothbrush with undiluted white vinegar and lightly scrub the crayon marks until gone. Gum Remover: Scrape off as much of the gum as possible. Heat up undiluted white vinegar in a microwave-safe container. Soak the bristles of a toothbrush in the solution and scrub remaining gum. Refurbish Holiday Ornaments into Clear Bulbs: Mix baking soda and water to form a paste. Use a paper towel to rub the paste onto the outside of the bulbs until the finishing starts to peel off. Fill the inside of the bulb with undiluted white vinegar and swish around until the inside coating wears away. Clean Chrome Hardware: Soak a few stacked paper towels in vinegar, ring them out and wrap around the faucet, handles or shower head for 10 minutes. Remove the wrap and let dry. Remove Mild Sweat Stains: Turn shirt inside out and soak the stained areas with undiluted white vinegar. Let sit for 15 minutes then gently scrub with a toothbrush. Wash the shirt in a normal rinse cycle using warm water. Keep Windows and Windshields Frost-Free: Moisten a cloth or a sponge with undiluted white vinegar. Wipe window or windshield to prevent ice from forming overnight. Prevent Ants: Dampen a cloth or sponge with undiluted white vinegar and run it along the perimeter of exterior windows and door frames. Remove Old Wallpaper: Combine one part white vinegar with one part water in a paint tray. Soak the roller brush and brush the unwanted wallpaper. Peel off. Remove Excess Candle Wax: Pull away as much of the hardened wax as you can. Moisten a paper towel with undiluted white vinegar and wipe until the wax is completely gone. Remove Iron Scorch Stains: Dampen a rag with white vinegar and wipe the scorch marks on your iron away. Prevent Mold on Shower Liners, Showers & Tubs: Pour one part water and white part undiluted white vinegar into a spray bottle. Spritz on after each shower or bath.